Ahead of the season 13 premiere on The CW, Supernatural stars Jared Padalecki, Jensen Ackles, and Misha Collins are talking about how the long-running drama series should end. Don’t panic, Supernatural hasn’t been cancelled, and no end date has been announced. Previously, we reported Padalecki, Ackles, and co-showrunner Robert Singer would like to take the TV series to 300 episodes, which would happen midway into season 14. The Supernatural season 12 finale was the 264th episode. From creator Eric Kripke, the Supernatural TV show first premiered on the now defunct network, The WB, on September 13, 2005. Season 13 will premiere on The CW on Thursday, October 12, 2017, at 8:00pm ET/PT. Mark Pellegrino also stars. The new season will feature a backdoor pilot for Wayward Sisters, a potential spin-off starring Kim Rhodes as Sheriff Jody Mills, Briana Buckmaster as Sheriff Donna Hanscum, Kathryn Newton as Claire Novak, Katherine Ramdeen as Alex Jones and Clark Backo as Patience Turner. 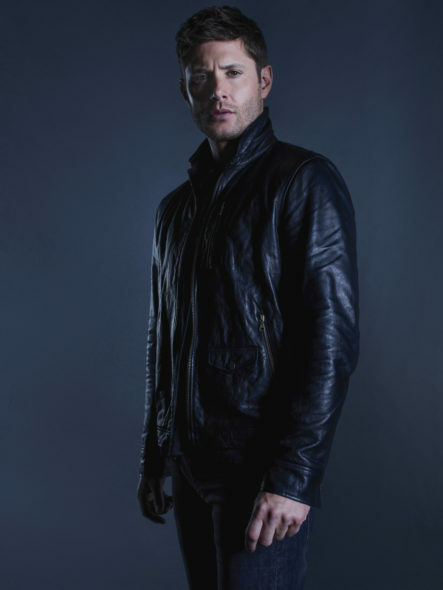 Ackles, who stars as Dean Winchester, told the news outlet that he’s dreamt about the ending of the series and thinks that dream could serve as the final season of the Supernatural TV series finale. Check it out. ‘I can see it right now’, Ackles says. ‘It’s just one scene. Think: Middle America, Big Sky country. It’s just wheat fields as far as the eye can see, and there’s an intersection, a crossroads, oddly enough. I drive up in the Impala, and I park in the middle of the intersection. There’s nobody for miles. I get out of the car and I look in the distance — and it’s like Lawrence of Arabia when Omar Sharif was running up with the camel — I just see this thing coming in the distance, and it gets closer and closer and closer and closer. It’s a guy on a motorbike. And we never really see his face. He’s got a helmet on. But he walks up and I give him a nod, and I take a walk around the Impala very slowly and I walk back over to him and I hand the keys to him. And he takes off his helmet — we don’t see who it is — he hands the helmet to me and hands me the keys to the bike. From his back, he gets in the car and I watch the Impala drive off. And then I turn and I look at the bike that’s got one seat. And I put the helmet on, start the bike, [give] one last look to the Impala, it’s now gone, and I take off. Because I don’t need the extra seat anymore. And I even have the soundtrack in my head. There were no words spoken. I had this swelling score. It was like some Robert Zemeckis film’. Collins, hearing the story for the first time, chimes in: ‘I can see the emotion in your face talking about it. It’s amazing to think that you’ve lived with these characters for so long that the idea of one of them dying actually even makes you, as Jensen, want to tear up’. It’s a mutual feeling among all three stars, who pause before Padalecki sums it up: ‘I feel like I know Jensen, I know Dean, I know Misha, I know Cas, I know myself, I know Sam, and [when the show ends], it’s going to feel like losing a friend. When it’s all said and done, it’s going to be tough. I’m going to lose several friends’. What do you think? Have you imagined a Supernatural TV series finale? Tell us all about it, in the comments. I too never want Supernatural to end. Everyone knows not to disturb me when they are on. I watch reruns all morning since I retired. I will continue to watch even if they are grey and on walkers, driving Baby…Best show ever, and yes, I would love to see Bobby come back. I love how he keeps them in line…somewhat..If I have to watch one last episode…I like Jensens’ idea but unless we have a idea what happened to the others, it would leave me with hope that they may come back…God Bless each and every one of you..
Those are both awesome. I especially like the second one – the symmetry of it. Good call on both! I know it’s not possible, but I don’t want this show to ever end. It is one of the best shows in TV history. I would happily still watch it 40 years from now, with Sam and Dean using a senior citizen’s home as their base of operations. Jensen Ackles tells a great story. However, as a very long time fan, I really don’t want the series to end. That rapport between the main characters is so strong;the stories are fun (yes, even the goriest parts) and I do love fantasy,sci fi,horror like this. Please don’t let it end. The boys are the best. As in heaven. Know show dean like jensen seen in his dream all alone,as we enter earth so shall we leave all alone by our selves. Great ending actually. Good Jensen. Really good.